February was one of the worst months I’ve ever had! Not because the market pulled back (that was a positive as it gave an opportunity to pick up some better values) but because of my wife’s health problems. I’m going to briefly address some of health challenges we faced in a bit. But first, February was an incredible month for dividend income. Truly, the dividend snowball is really starting to grow! This is the year of big gains for my dividend income. Last year, when I was given the keys to my 401k account to invest, I planted the seed for some huge dividend income growth. Well, that money is pretty much all invested now, and this year the fruits of that work are being seen. Big time! This month I received $748.92 in dividend income. On average, I received $29.95 paychecks from 25 incredible companies. While this isn’t my highest monthly dividend income rake, it’s still a lot! This is a 267.28% increase over February 2017! 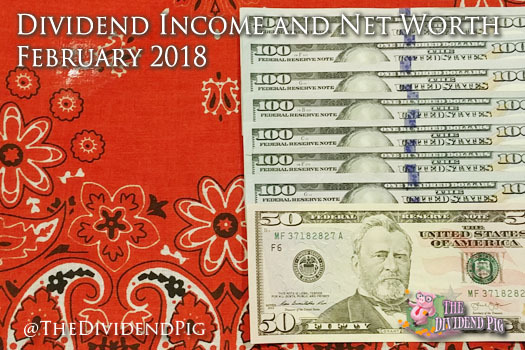 February’s income covers all of my utilities and food for the month! I had a slight net worth drop this month, but nothing too terrible. We had a lot of health care bills this month. A lot of red this month with regards to cash. My wife’s health insurance deductible needed to be paid. We quickly blew through almost $9,000! It’s a lot of money, but it’s a mere 3% of the total hospital bill that we received. We are extremely fortunate to have health insurance to cover these type of events. And even more fortunate to have an emergency fund that we can use to pay for these types of expenses. You’ll also notice that there is still a large sum of cash sitting in the account. This is from the sale of rental property #1. That money will be used to payoff our primary home mortgage. Just need to finish the taxes to figure out how much we will owe the government. As I’ve mentioned several times on the blog, my wife has some health issues. Sadly, three months after her last surgery, she needed another one as she received some scary test results (think of the bad word that begins with the letter C). After meeting with an oncologist, we were pretty certain that it was NOT anything bad (THANK GOD), but the growths needed to come out. The surgery lasted almost 7 hours. After she was done, we learned that some repairs to her colon were needed as there were some perforations during the procedure. After about 24 hours, my wife was in the worst pain of her life (she said it was worse than child birth). Two hours later she was rolled into another surgery. Fortunately, the doctor was able to quickly find and repair the ruptured colon spot. This surgery lasted less than 45 minutes. To make a long story short, her ruptured colon allowed bacteria to into her abdomen and blood. I later learned she was septic (that’s bad) along with some other bad stuff. She had huge doses of antibiotics, had to get nutrition through her veins, couldn’t move, was in excruciating pain and was in the hospital for almost 3 weeks – with several trips to the ICU. Fortunately, she is now on the road to recovery. As we understand it, she should be back at 100% in about 4 more months. Just around the corner, right? While it’s a long road we are traveling, I’m thankful we are all at home together now! With rental property #1 out of the picture, we’ve cut our rental income profits by a little more than half. That will be fine for now. Our tentative plan is to continue to work on rental property #2 mortgage and pay that off quickly. When that unit is paid off, we plan to use that rental income to finance another unit if/when we find one. Rental property #2 is still paying on time and without issue! Best kind of tenants to have! Dividend income is quickly paying for more and more of my monthly expenses. 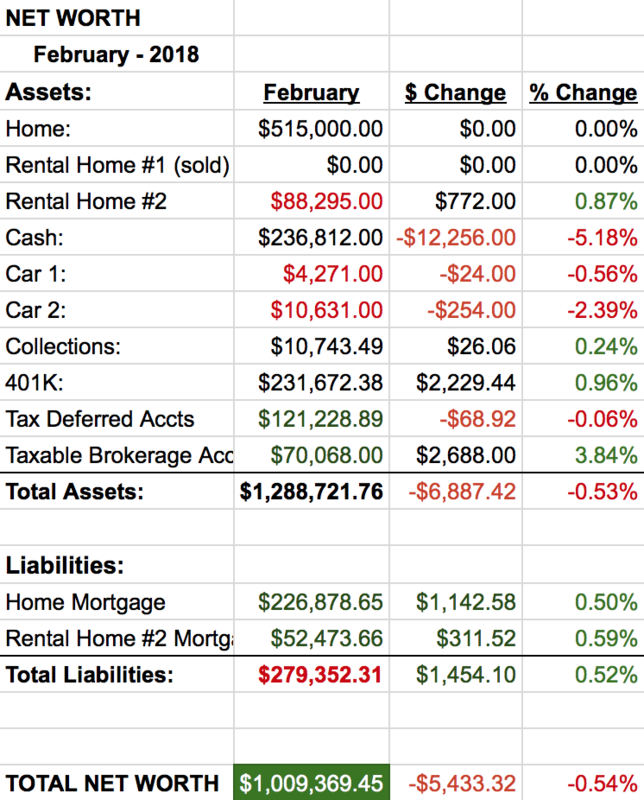 Once my primary mortgage is paid off, dividend income will cover a huge portion of my bills! Even with the market taking a down turn, dividend income will continue to come in. Best wishes for your family. So glad your wife is on the mend, that is beyond scary! It really puts everything else in perspective when you face a health crisis and it is great she had you to lean on and handle everything when she was sidelined. Thank you Steveark! Exactly my thoughts, trials like this sure do put everyday troubles into perspective. Nothing is more important than family and health! Thank you for the kind comment, and congratulations on retiring! I read through your blog and really enjoyed your perspective! Keep up the great work! So glad to hear that your wife is doing much better, thank the Lord! Take one day out of time. Nice job, as well, from a February dividend income front. Indeed! It’s been a hard few months, but i’m so grateful we are pretty much on the other side of this now. As for dividend income, February was a great month but March, well, that was just mind blowing. Always good to hear from you!